Private gated acreage home (3200sq ft inside/ outside 1000 sq ft of covered patio) only 3 miles from the Comal River, Schlitterbahn, Guadeloupe River, and the Outlet Malls. 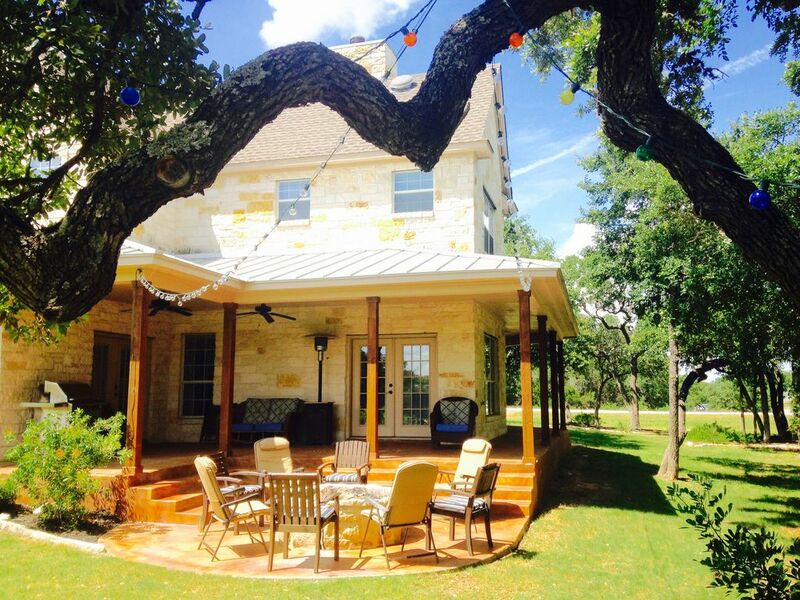 You will enjoy the space of a FULLY furnished custom house, hotel quality bedding/towels, amazing back yard with fire-pit for smor's, with all New Braunfels has to offer. Custom Golf Cart included for Pool Runs (Over 18 to drive). Downtown New Braunfels offers fine dining, entertainment, and numerous activities close by. Gruene Hall, Texas’ oldest dance hall, is a short drive away and is famous for the live entertainers who sing on stage every day. Gruene also offers great shopping, restaurants and wine tasting. Lake McQueeney is a great place to water ski and is a short five minute drive, and Canyon Lake, a much larger lake is about a 20-minute drive. Want to shop? The outlet malls, Prime and Tanger, are only five minutes away! Situated between Austin and San Antonio, there are unlimited tourist attractions within a reasonable driving distance. If your vacation plans include a trip to San Antonio to visit Sea World, Fiesta Texas, the Riverwalk, Natural Bridge Caverns, or the Alamo, we are minutes from IH-35, and an easy 25-minute drive to downtown San Antonio. Austin (the State capital of Texas) is known for its live music and numerous exquisite restaurants and is only a one hour drive. And don’t forget to visit San Marcos with its famous outlet malls and the Power Olympic Whitewater Kayaking center located on the San Marcos River. Gruene Hall, Schlitterbahn, Guadalupe River, Comal River, San Marcos River – Power Olympic outdoor center, Canyon Lake, San Marcos Outlet Malls, Landa Park, Natural Bridge Caverns, Natural Bridge Wildlife Ranch, River Road Icehouse, Whitewater Amphitheater, Schlitterbahn Hill Country Christmas, Various Massage & Beauty Spas. AREA GOLF COURSES: Landa Park Golf Course, The Bandit Golf Course, Canyon Lake Golf Course. ANTIQUES: Palace Heights Antiques Mall, Red Rooster Antiques Mall, Thumbalina's Antiques & Collectibles. DOWNTOWN RESTAURANTS AND ATTRACTIONS: Huisache Grill, Myron’s Steakhouse, Liberty Bistro, Friesenhaus (Authentic German Style Restaurant), Piano Bar, Oyster Bar, McKenna Children’s Museum, Sophienburg Museum. BBQ: Coopers Old Time Pit BBQ, Rudy’s Country Store and BBQ, New Braunfels Smoke House, Granzin’s, Canyon Trail Chuckwagon Supper & Cowboy Music and Show. All 3 full size baths have soaker size tubes one jetted with separate showers. The house was clean and wonderful. Very spacious and nice shaded outdoor area. Owner left several bottles of wine for our arrival which was awesome! Very nice owner and was very responsive. Thank You...it was our pleasure to have yall! Would easily rate the property 4.5 stars but there were a few things unique to our stay that drag down the overall rating. Overall, with a little upkeep on property (like patching the open space / seal in the french doors in the master bedroom to block the scorpions & spiders from getting in) this is a wonderful place to bring families with small kids and deserving of a stronger rating. However, given the issues we had with our stay...it gets 3 stars this time around. Would potentially rent again...with assurances the AC works, insect prevention is strong / recent treatment and the pool key works. Thank You so much for you feedback. I apologize for the series of mishaps! If you return next year we will add 3 days to your stay for your trouble with some of your favorites "Bobcat" beverages stocked in the frig. The house now has a completely new A/C system and the french doors seems have been replaced. A great place for a family get-a-way. We had a great time. Everything in the house was better than expected. The only con is that the swimming pool is about a mile away. Other than that, it is a great place for a perfect family retreat. Thank You! And we hope you can return next 4th of July! Schlitterban, Old Town Gruene, Guadolope river 5 miles. 4 miles from OutLet Mall.